The type of lift chosen for a shop can dramatically impact the facility’s productivity level. For example, of the different types of mobile lifts, the faster raising and lowering hydraulic lifts—as opposed to the slower operating electromechanical lifts—can add 54 man-hours of productive repair time per year to your facility based on the one minute up/one minute down cycle time vs lifts that take three minutes up and three minutes down (54 hours assumes you raise four vehicles per day). If this is extended over five years, that’s an extra 270 hours of productive repair time. While the previous example is specific to mobile lifts, the most common lift type is the above ground two-post frame engaging lift for light vehicles and mid-size trucks. 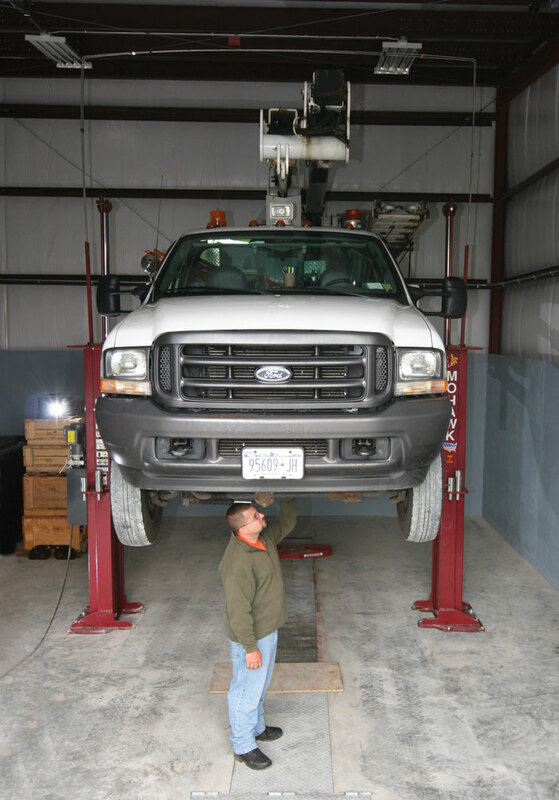 Each time the lift is raised, the shop technicians must bend down and properly position the four individual swing arms and the sliders at the proper lifting points of the vehicle. But, what if you didn’t have to position the swing arms? Some lift companies offer a lifting pad instead of four swing arms, since the pads speed up certain routine maintenance jobs, such as oil changes. However, these pads are also limited, as they get in the tech’s way on services. Yet, there is a solution. The Mohawk Speedlane, unlike pad-type two-post lifts, gives shops the versatility of using the lift as a normal swing arm lift or a drive on pad lift for tire or brake service. Like a pad-type two-post lift, the Speedlane can improve turnaround time without limiting what services can be performed. Two-post lifts are the most common lift type, servicing small and mid-size vehicles. Doing exhaust work and want the exhaust system to “hang” at ride level? Of course, yet a swing arm lift doesn’t allow this due to the hanging suspension. Tire engaging wheel adaptors can be added to the ends of the swing arms to speed arm placement and raise vehicles faster. 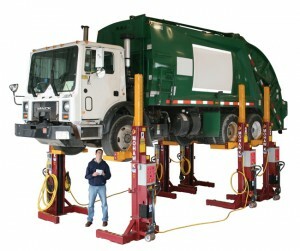 Two-post lifts are the most common lift type, servicing small and mid-size vehicles. Yet, as municipalities and landscaping fleets need to also service turf maintenance equipment, some two-post lifts have the versatility to service light vehicles, trucks, and turf equipment. Ask the manufacturer what lift options and accessories are available to assist in servicing different types of vehicles and equipment. Mobile lifts offer the versatility of not having to dedicate a bay to a fixed position lift. When using high reach jack stands, the columns can be moved to another bay with the first vehicle remaining in the air for service. 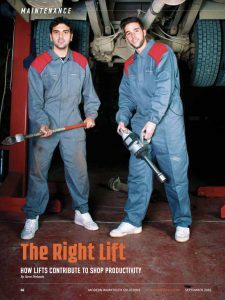 The disadvantages of mobile lifts is the few minute setup time to position columns at each tire, yet they offer the flexibility to service light vehicles, raise vehicles front to rear or, used in pairs, to service forklifts. Having the lift manufacturer do a site survey in advance of purchasing can help to determine where the lifts should be located based on traffic flow and proximity to tool storage. The survey also ensures there is adequate concrete to safely bolt down the specific lift model, proper electricity for operation, and sufficient ceiling height to fully lift all vehicles. Request a site survey to avoid a four-post lift with 30-ft tracks being delivered when there is only room for 25 ft. Upon completion of the site survey, one should be confident that the type of lift they have decided on will successfully work in his or her shop. Have the lift manufacturer do a site survey in advance of purchasing to help determine where the lift should be located and ensure there is adequate concrete to safely bolt down the specific lift model. To justify a lift purchase, the 94th Army Command needed to purchase lifts for 10 of their facilities in the northeast. The person in charge compared the time savings between using floor jacks, jack stands, and creepers vs two-post lifts. The determination was that based upon the number of vehicles being serviced, the lift purchase equated to a $140,000 cost saving in just the first year. There was a 40 minute time savings per vehicle when using a two-post lift vs jacks and creepers. Shop efficiency is all about getting the repair job in and out of your garage faster to increase the percentage of vehicles on the road and working. Since “time is money,” keeping your fleet on the street will do the same for your operation. Steve Perlstein has been with Mohawk Lifts for 35 years and brings the experience of growing up in the family garage.